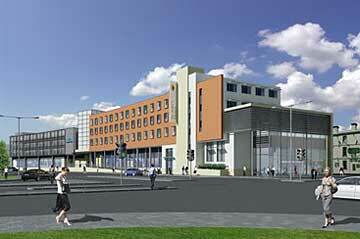 The outlet centre will have around 100 shop units selling top name fashion and homeware items at discounted prices. The two main parts of the centre, designed by Dyer of Cheltenham, will be on either side of High Orchard St (picture right). On the left, the former Matthews furniture factory buildings will be linked to a large covered mall of shopping units with multi-storey car parking over. The block on the right will contain additional retail units and two pedestrian arcades leading through to Merchants Rd. The centre is expected to attract three million visitors a year, many of whom will visit the main docks area and the city centre. The southern corner of the outlet centre, fronting on to St Ann Way and Southgate St, will have shops on the ground floor and a budget hotel above (picture right). Car access to the outlet centre multi-storey car park will be off St Ann Way, and hotel visitors will be able to use the same facilities. 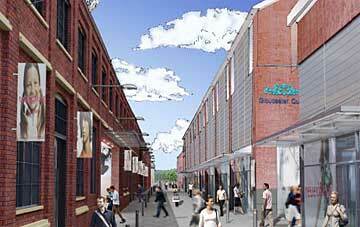 The aim is to have the first phase of the outlet centre open by spring 2009. To see how work is progressing, visit the progress page. 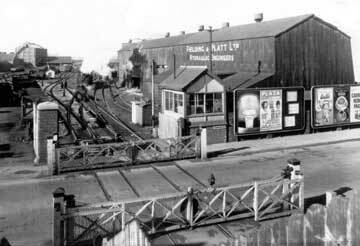 Fielding & Platt started as general engineers in 1866, taking over an existing business on the site. A few years later, they began making a portable hydraulic riveter which became widely used in the construction industry around the world. In later years, the company produced many other forms of hydraulic equipment, particularly presses, and was a major employer in Gloucester. However, business declined in the 1980s, and the company was taken over by Motherwell Bridge Ltd in the 1990s and closed down.